Well, needless to say I thoroughly enjoyed the Conference again this year, the presentations, and especially those by the two keynote speakers, were excellent, and I left invigorated. Thanks so much for those who so generously make this Conference possible, especially Kahena, Jeffrey, and William! I take the libery of copying here a review by Patrick Wolff from The Wild Hunt. The ninth annual Conference on Current Pagan Studies met at Claremont Graduate University in the city of Claremont, California on January 26-27. This is a unique academic conference, not only for its topical focus on Pagan Studies, but for its inclusion of both academic and non-academic Pagans as presenters. Both the conference theme and the selection of keynote speakers exemplified the desire to, as the tagline of the conference website puts it, bring “Academia and Community Together.” The conference theme, “Pagan Sensibilities in Action,” covered not only ritual and spiritual practice but history, art, social justice, environmental concerns, psychology, politics, and other topics. The theme reflected a concern that is current in many religions, a desire to explore the implications of one’s theology (or thealogy, or theoilogy, as the case may be) in all aspects of life. The two keynote speakers embodied this theme, one a recognized scholar in the fields of folklore and anthropology and the other an activist with experience fighting for social justice as well as service through disaster relief and emergency care. Dr. Sabina Magliocco, Professor of Anthropology at California State University, Northridge, and author of numerous books including Witching Culture: Folklore and Neo-Paganism in America and Neo-Pagan Sacred Art and Altars: Making Things Whole, presented a lecture titled “The Rise of Pagan Fundamentalism.” Joking that she hoped to avoid being tarred and feathered, Magliocco identified two tendencies of Pagan Fundamentalism, both of which centered on the concept of belief. As a broad religious phenomenon, fundamentalists in all religions insist on a literalist interpretation of foundational texts, and demand conformity of belief as the primary marker of a genuine religious identity. Those who do not share these essential beliefs are viewed with suspicion, or rejected as imposters. The first belief is in the literal historicity of the foundational narrative of paganism as an unbroken stream flowing from the ancient past to the present. This “received” view of Pagan (particularly Wiccan) history, shaped by Margaret Murray and Gerald Gardner, holds that the Old Religion persisted throughout the centuries amidst persecution, passed down as a closely guarded secret to initiates into the present day. However, when subjected to the scrutiny of critical historical scholarship, the foundational myth of pure Paganism transmitted through the ages was revealed to be lacking in solid historical evidence. Revisionists, most notably English historian Ronald Hutton, author of Triumph of the Moon: A History of Modern Pagan Witchcraft, contended that Wicca was better understood as a new religious movement than as a preserved ancient one. Counter-revisionists, such as Ben Whitmore, author of Trials of the Moon: Reopening the Case for Historical Witchcraft, have objected that Hutton overstated his case, ignoring or minimizing evidence for continuity in the transmission of Wicca (to which Hutton has replied in his article “Revisionism and Counter-Revisionism in Pagan History” in the most recent issue of Pomegranate). The claims of revisionist historians can come as quite a shock to Pagans who never had reason to question the received myth of Pagan origins, and while many were open to the new perspective, others experienced a crisis of cognitive dissonance which was countered by an uncritical insistence on the literal truth of the myth of pagan origins and a dismissal of, or attack on, revisionist arguments. Since the revisionist perspective presented Wicca as an eclectic, creative religious movement influenced by other forms of occultism and Romanticism, those most opposed to it were often those whose Paganism was heavily invested in the claim of possessing secret knowledge passed through carefully guarded secret initiations. This debate over Pagan origins is not merely an ivory tower discussion, since how Pagans view their past will shape their future. 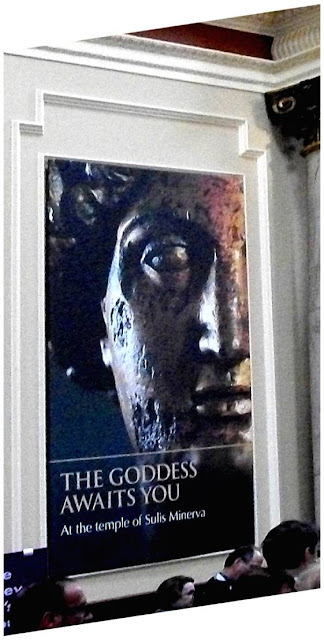 The second tendency that has emerged in Pagan Fundamentalism is a belief in gods and goddesses as literal spiritual persons, formulated as a reaction against the emergence of humanistic paganism and panentheistic or archetypal interpretations of the divine. However, Magliocco argued, historically Wiccans have varied greatly in their theology, and found unity not in right belief, but in common practice. 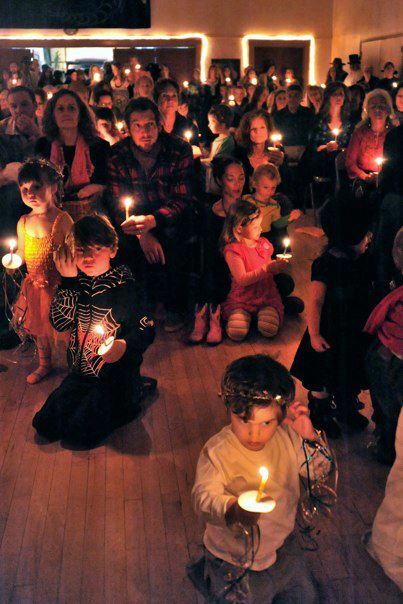 Against this non-dogmatic tradition of finding shared identity through ritual, Pagan Fundamentalists seek to exclude those who do not hold to their “orthodox” pagan belief in the nature of the gods. This is problematic, Magliocco argued, because it imported a criteria from the dominant Abrahamic faiths that was ill-suited to the ritual-focused nature of Paganism. Why has belief emerged as a critical identity marker now, when it did not function this way in the past? Magliocco pointed to several reasons, such as a desire legitimate Paganism as a “real religion” in the eyes of adherents of other religions (which comes as a result of the growth in size and influence of Paganism), and a quest for certainty in a tumultuous marketplace of religious ideas (a motivating factor in the fundamentalist strand of all religions). But her third reason pointed to what would become a theme throughout much of the rest of the conference: the role of the Internet, and particularly comments on blogs, that dank and murky lair of trolls, where insults fly freely and rational reflection is beaten down by bombast. The Internet tends to encourage “enclaves of idiosyncratic views,” unchallenged by real-world interaction with those holding differing views, and provides a veil of anonymity that allows abusive behavior that would not be tolerated in face to face interactions. After her presentation, one questioner raised the intriguing possibility that the Internet actually encourages fundamentalism, since online (particularly in blogs and blog comments) individuals are easily reduced to text-based persons. The second keynote address, “Stirring the Cauldron of Pagan Sensibilities,” was presented by Peter Dybing, a national disaster team Section Chief with experience as a firefighter and EMT as well as serving on the board member 100% for Haiti and a former National First Officer of Covenant of the Goddess. Stressing is non-academic identity, Dybing challenged attendees to “suspend your academic approach, and access your emotions,” issuing a call to action rather than offering intellectual reflection. His first two points called for a new look at the questions of Pagan leadership and the role of elders. While acknowledging the strengths found in Traditional (hierarchical, individual-focused) and Organic (communal and local) models of leadership, as well as the dangers of what he termed Fantasy Leadership (the self-appointed blogger harassing his or her enemies online, “liked” by clique of online admirers ), Dybing drew from his experience in disaster relief to formulate a Transformative model of leadership, one that is mission-based and organizationally-focused. Leadership should not be limited to the Priest or Priestess as representatives of the God or Goddess, but should be shared based on recognition of diverse skills and expertise. On the related topic of Pagan elders, Dybing stressed the importance of honoring the body of work left by an elder without venerating the person. Elders, even after death, must be remembered as human beings, not saints. 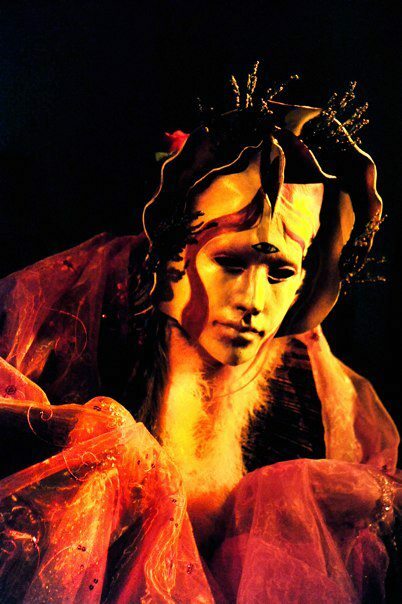 Though the first part of presentation took up the majority of his time, it was in the second part that Dybing most fully revealed his own heart through a call to service as an expression of Pagan spirituality. 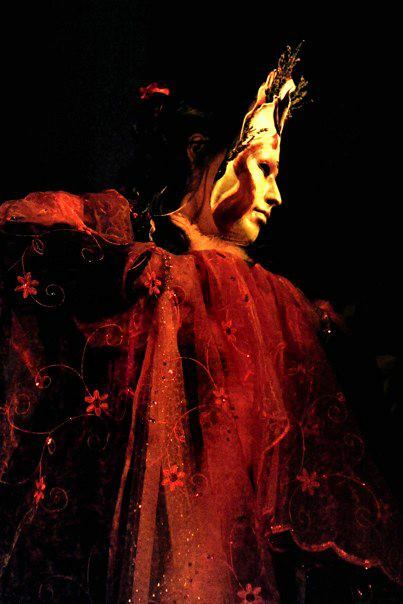 It was in offering direct aid for the good of others, whether in international aid or in community service, that Dybing said he most fully felt the presence of the Goddess. In a time of environmental degradation, Dybing warned, we must expect a future of natural disasters on an unprecedented scale, and Pagans are uniquely qualified to respond to these challenges. 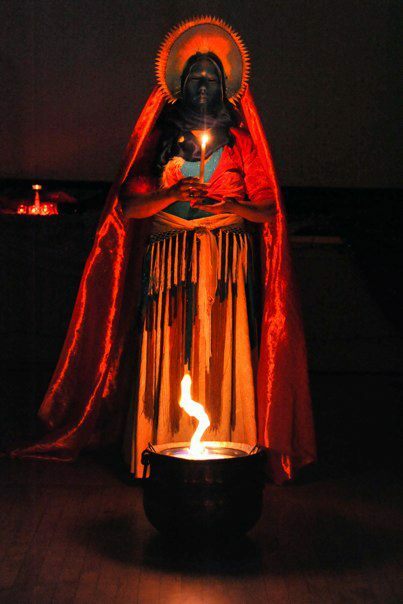 While Magliocco made the case that Paganism should continue to value ritual action over belief, Dybing called on Pagans to pursue active service as a practice of Pagan spirituality. The other twenty-five presentations were too varied and rich to be adequately summarized here, with topics ranging from theology to psychology, good pedagogy in the classroom to creating masks (and even the pedagogy of making masks), environmentalism, politics, and mysticism. One particularly exciting project described was the Pagan History Project, which will record oral histories of Pagans, similar to the oral history project being conducted by many universities of World War II veterans. Several times a desire was expressed to continue discussion after the conference ended, either on the conference website or Facebook page. This does not seem to have happened yet, but it would be another way to bring Pagan scholarship into conversation with the broader Pagan community. In addition to the thoughtful nature of the presentations, two other aspects of the conference are worth noting. First, there was an ethos of dialogue and conversation among the approximately fifty attendees, so much so that interaction between the presenter and audience sometimes broke out in the middle of a presentation, a rare occurrence in a typical academic conference. Second, the atmosphere of the conference could be described as convivial, with a great deal of laughter and good spirits. In this way, the conference itself was a manifestation of Pagan sensibility. Pagan Studies has come under recent criticism by some for a lack of necessary critical distance from its subject (see, for example,, Markus Altena Davidsen, “What is Wrong with Pagan Studies?” in Method and Theory in the Study of Religion, available online). This criticism is not without merit. The calling of a scholar of religion is not to support the religion being studied, but to understand it, and the conclusions that come from scholarly inquiry are not always welcome to those being studied (hence Magliocco’s “tar and feathering” comment). Further, too much of an “insider” atmosphere can create an us-and-them dichotomy which distances or even excludes outsiders. The “them” could be non-insider scholars or practitioners of other religions, viewed as outsiders who can never really “get” those on the inside (some of this could be seen by the dramatic eye-rolling and snarky asides from one presenter whenever he made mention of Christian beliefs, something that would not be tolerated in other academic conferences). 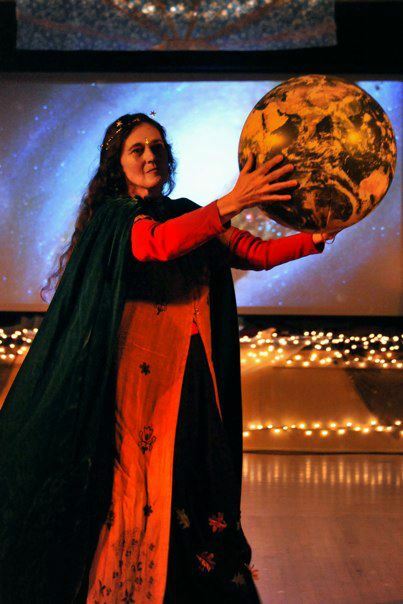 One Pagan Reconstructionist presenter admitted she had felt nervous about attending a conference of Wiccans and Neopagans, and while she was warmly welcomed, her initial misgivings say something about how the conference could be perceived by outsiders. The lines of insider and outsider in scholarship are not always clear cut, however, and if there is a danger in insider scholarship designed to offer the benefits of scholarly insight to contribute to the flourishing of one’s own religious community, the opposite danger is scholarship for the sake of no one, except perhaps the expansion of the scholar’s own reputation (and ego). Granted that much of what academics call risky seems rather dreary to most people, the conference organizer, Dorothea Kahena Viale, should be commended for taking the risk of envisioning a conference that seeks to connect scholars with practitioners and intellectuals with activists. 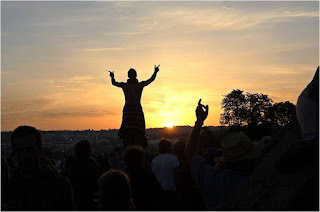 There must be a place for scholarship for the good of the community, and for Pagans, one place this can be found is the Conference on Current Pagan Studies. The Romans believed that special places were inhabited by intelligences they called Numina, the "genius loci" of a particular place. I believe many mythologies are rooted in actual experiences of "spirit of place", the "living landscape", a conversation within which we also participate. Myth is, and always has been, a way for human beings to become intimate and conversant with what is vast, deep, and ultimately mysterious. Our experience changes when Place becomes "you" or "Thou" instead of "it". There are many disciplines now writing about the importance of place, asking, in essence, “how can we renew our ancient conversation with the Earth"? As pagans I believe we are uniquely able to answer that question, and lead the way into re-mything our culture. 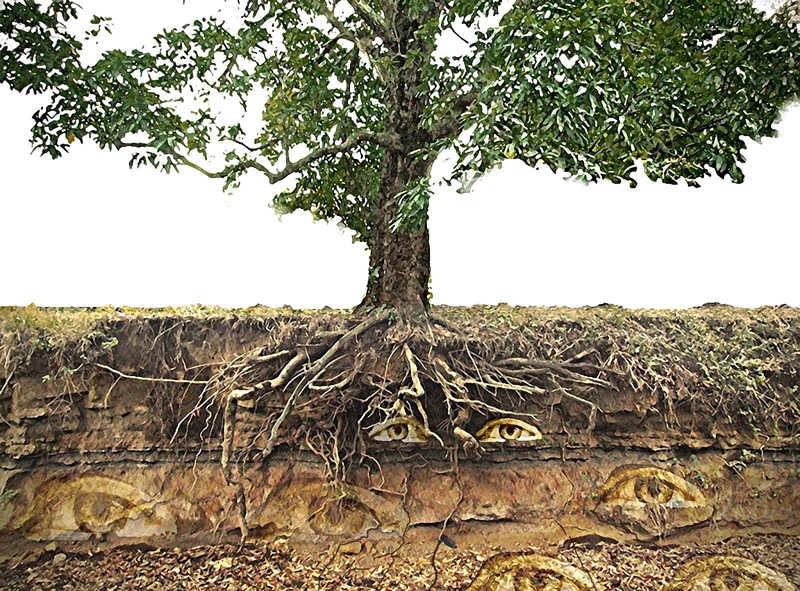 In the past, "Nature" was not just a "backdrop" or a "resource"...........nature was a relationship within which cultures were profoundly embedded. Whether we speak of the aborigines of Australia, Celtic fey folk, or the agrarian roots of Rome, the landscape was spiritually personified. Every valley, orchard, healing spring or womb-like cave had its unique quality and force - its Numina. Cooperation and respect for the Numina was essential for well-being. And some places were places of special power, places of pilgrimage. With the evolution of monotheism and religions that increasingly removed divinity from Nature and the body, and in the past century, the rise of industrialization, we have looked at the world primarily from a "users" point of view. This screen tends to frame the world as an object. Yet every culture, including ours, has insisted throughout its pre-industrial stages that the world is alive, and responsive to what human beings do upon it. From katchinas to the Orisha, naiads to dryads, the Australian Dream Time to Alchemy's Anima Mundi, every local myth reflects what the Greeks and Romans knew as the resident “spirit of place”, the Genious Loci. 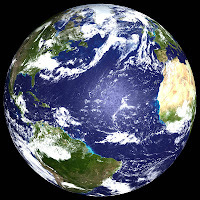 Contemporary Gaia Theory proposes that the Earth is a living, self-regulating organism, responsive and evolving. If one is sympathetic to Gaia Theory, it follows that everything is responsive and conversant in some way, visible and invisible. Sacred places may be places where the potential for revelation, healing, or transpersonal experience is especially potent. 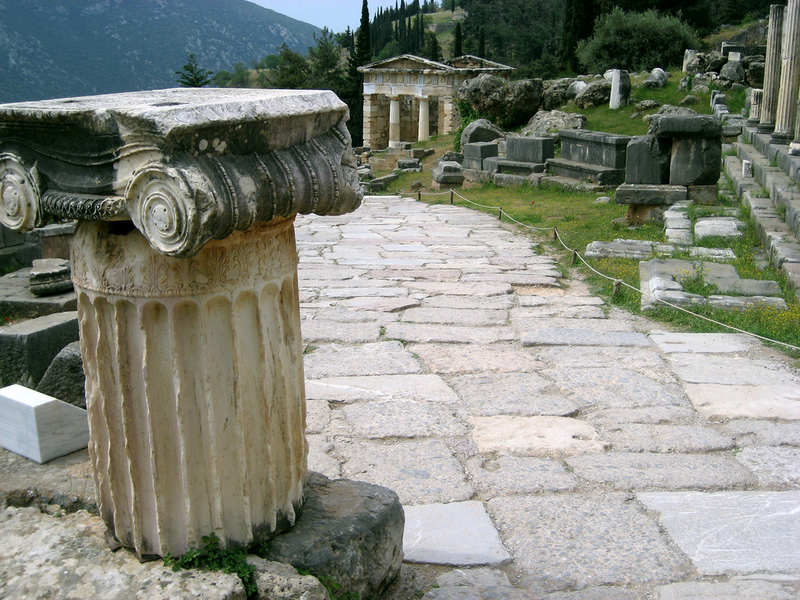 Ancient Greeks built their Oracle at Delphi for this reason, and certainly early Christians knew this when they built churches on existing pagan sites. There is a geo-magnetic, terrestrial energy concentrated at certain places on our planet that throughout the millennia catalyzes spiritual insight, healing, visionary experience, even prophecy. Before they became contained and mythologized by religions or marked by prehistoric monuments, these sites were intrinsically places of numinous power and presence in their own right. They radiate their powers to all who visit, and ultimately, no practice of a particular religion or belief system is needed for them to have a transformative effect, although human architecture and the accumulation of human psychic energy and visitation may amplify this effect. "If you have come upon a grove that is thick with ancient trees which rise far above their usual height and block the view of the sky with their cover of intertwining branches, then the loftiness of the forest and the seclusion of the place and the wonder of the unbroken shade in the midst of open space will create in you a feeling of a divine presence, a Numina." 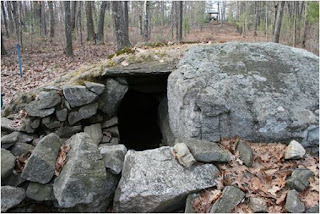 Many years ago I lived in Vermont, and one fall morning I stumbled down to the Inn for a cup of coffee to discover a group of people about to visit one of Vermont's mysterious stone cairns on Putney Mountain. Among the researchers was Sig Lonegren, a well known dowser and researcher of earth mysteries. Before I had my second cup of coffee I found myself on the bus, and then at a chamber constructed of huge stones, hidden among brilliant foliage, with an entrance way perfectly framing the Summer Solstice. No one knows who built these structures, which occur by the hundreds up and down the Connecticut River, but approaching the site I felt such a rush of vitality it took my breath away. I was stunned when Sig placed divining rods in my hands, and I watched them open as we traced the ley lines that ran into this site. Standing on the top of the somewhat submerged chamber, my divining rod "helicoptered", letting me know that this was the crossing of two leys, a potent place. Months later 13 friends gathered in the dark to sit in that chamber and watch the sun rise through its entrance way. We were not a coven, I had not even heard of such a thing, but we all felt the power of the deep, vibrant energy there, and awe as the sun rose illuminating the chamber. None of us knew what to do, so we held hands and chanted Aum. We were all as high as a kite when we left, and this was the beginning of a life long journey for me, a journey that led me here. Earth mysteries researchers like John Steele and Paul Deveraux in their book EARTHMIND have written that we suffer from "geomantic amnesia". We have forgotten how to listen to the Earth, to engage in "geomantic reciprocity", instinctively, mythically, and practically, to our great loss and endangerment. We disregard or destroy for short term economic gain places of power, and conversely, build homes, even hospitals, on places that are geomagnetic ally toxic. 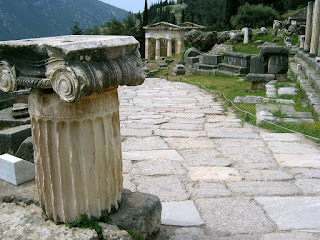 The ancient Greeks built their shrine for Gaia at Delphi because the unique personality of that place was divined to be especially suited to Gaia residing there. They also sited their healing Dream Temples according to the auspiciousness of place. Honoring what inspired the early Greeks to decide on a particular place may be important not only to pilgrims, but to something at the base of building future sustainable human societies. The act of making a pilgrimage is among the oldest human endeavors. Recent discoveries at Gobekli Tepe in Turkey include a landscape of monolithic temples that peoples journeyed to 12,000 years ago. The Eleusinian Mysteries combined spirit of place and mythic enactment to transform pilgrims, and enact the death/rebirth cycle of nature, for almost 2,500 years. 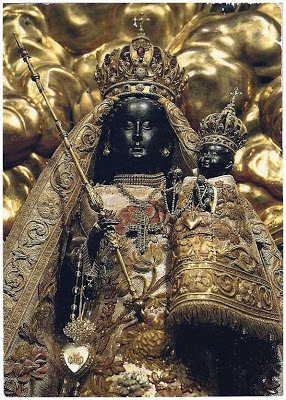 I believe there are both leylines and mythic “songlines" that trace ancient pilgrimages to the Black Madonnas of Europe (which are still going on). One of the most famous is the "Camino" which concludes at the Cathedral of Santiago at Compostella. 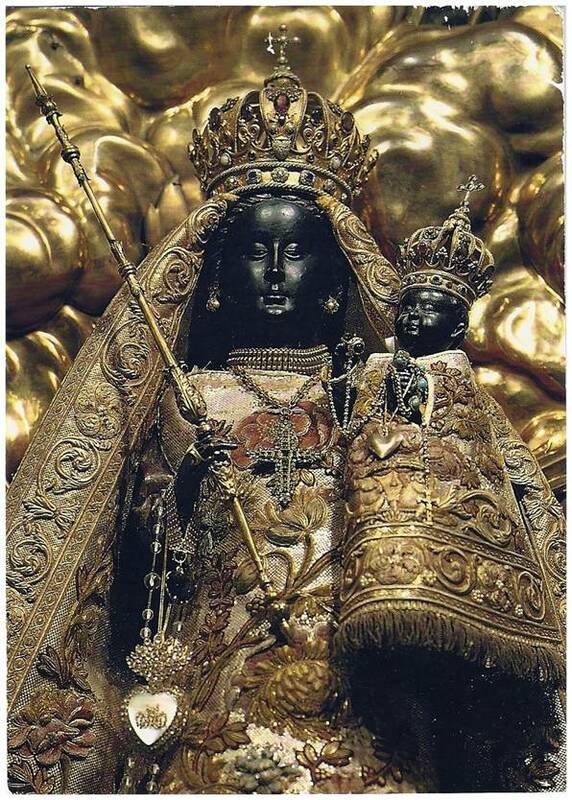 Some believe the earliest Camino was to the “Black Madonna of Compostella", a very ancient effigy. Compostella comes from the same root word as "compost", the fertile soil created from rotting organic matter, the "dark matter" to which everything living returns, and is continually resurrected by the processes of nature into new life, new form. Pilgrims finally arriving in Compostella after their long journey were being 'composted' in a sense. Emerging from the dark confines of the cathedral they were ready to return home with their spirits reborn. 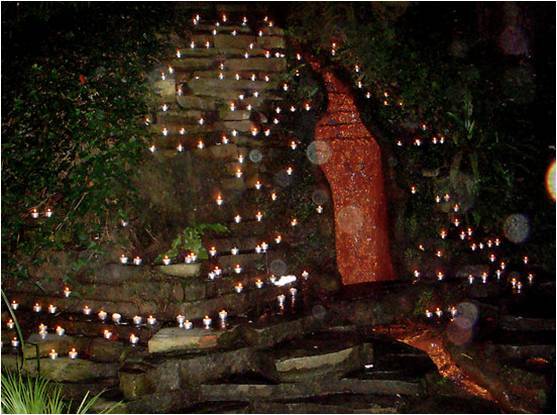 In 2011 I visited the ancient sacred springs of Glastonbury, the Chalice Well and the White Spring as well as participating in the Goddess Conference there. 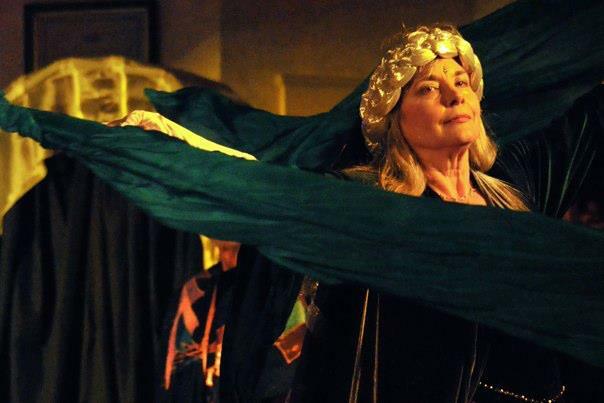 Making this intentional Pilgrimage was life changing, and I had a profound, personal sense of the "Spirit of Place", what some call the "Lady of Avalon". 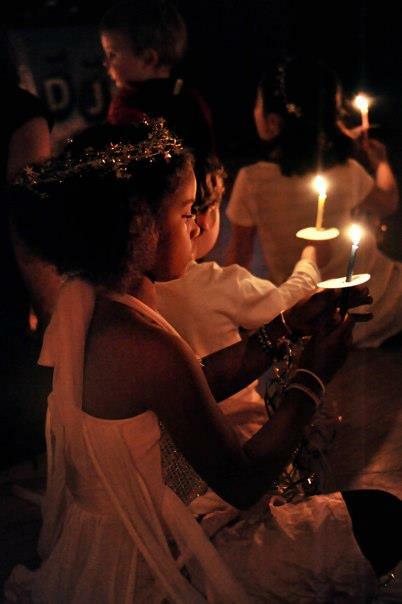 Pilgrimage opens one to blessing, vision, and reverence. As a dowser myself, I've experienced shifts in energy - which means also shifts in consciousness -many times when visiting areas that are geomantically potent, be it the henge of Avebury, or the labyrinth at Unity Church in Tucson, Glastonbury, or even a crop circle in Wiltshire. Freddy Silva is an Englishman who has spent many years researching authentic Crop Circles. He has found that they have unique phenomena, including magnetic and energetic properties, which have been documented to alter consciousness and affect the health of some individuals. 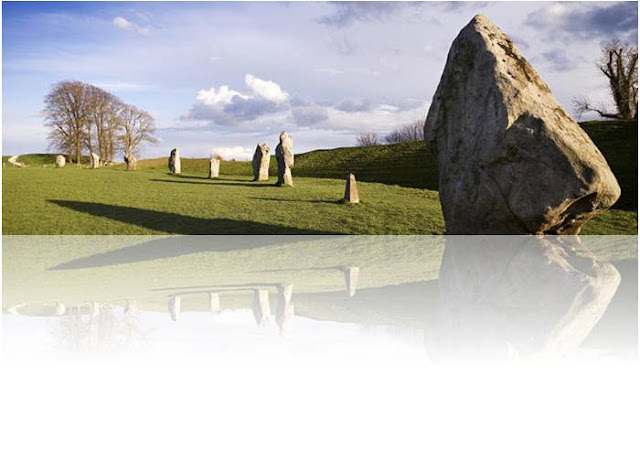 The vast majority of the documented authentic crop circles have occurred near prehistoric standing stones, Silbury Hill, and other places of geomantic potency near by. Silva believes they are not only communicating through the universal language of symbol and Mandela but they are also, speaking in terms of subtle energies, changing the land and underground water tables in some way - perhaps, an infusion, a "pollination". He calls them "Temporary Temples". Sacred Sites are able to raise energy because they are intrinsically geomantically potent, and they also become potent because of human interaction with the innate intelligence of place. My teacher, spiritual dowser Sig Lonegren, has spent many years exploring sacred places, and commented that possibly, as human culture and language became increasingly complex, we began to lose mediumistic consciousness, a daily, conversational Gnosis with the "subtle realms". With the gradual ascendancy of left-brained reasoning he suggests the ancients were concerned with how to continue contact with the gods, the ancestors, the numina of the land. According to Sig, Stonehenge may represent a "last ditch effort" to keep in touch with the spirit world with communal experience. As the rift between personal gnosis and spiritual contact deepened with the development of patriarchal institutions, tribal and individual Gnosis was replaced by complex religious institutions that rendered spiritual authority to priests who were viewed as the sole representatives of the Gods or God. Perhaps this capacity is returning to us now, a new evolutionary balance. As crisis engulfs us, we need, once again, to re-member how to “speak to the Earth", to make pilgrimage to the Source, by whatever name. I'm very pleased to be able to present again at the Conference this year..........if you live in the Los Angeles area, perhaps I'll see you there! James Lovelock, the Father of Gaia Theory (with collaborator Lynn Margulis) is 94. I felt like making a mask dedicated to Gaia, and to him. Lovelock truly did offer a new paradigm to the Earlth Sciences community, and the world in general, and certainly Gaia Theory has had a profound impact on me. The idea the the Earth is a living being, self-regulating, evolving, and we participate in that evolution...........has truly been a paradigm shift. It's very important now to find hope, and there are heroes all over the place, I've found, people doing great things for both the present and the future, and yet you rarely hear of them. New Zealander Peter Proctor and his wife are such Heroes, quietly creating a revolution with biodymanic agriculture. As we face the consequences of big business farming and an unsustainable future, here is another movie that is freely available, and very important. 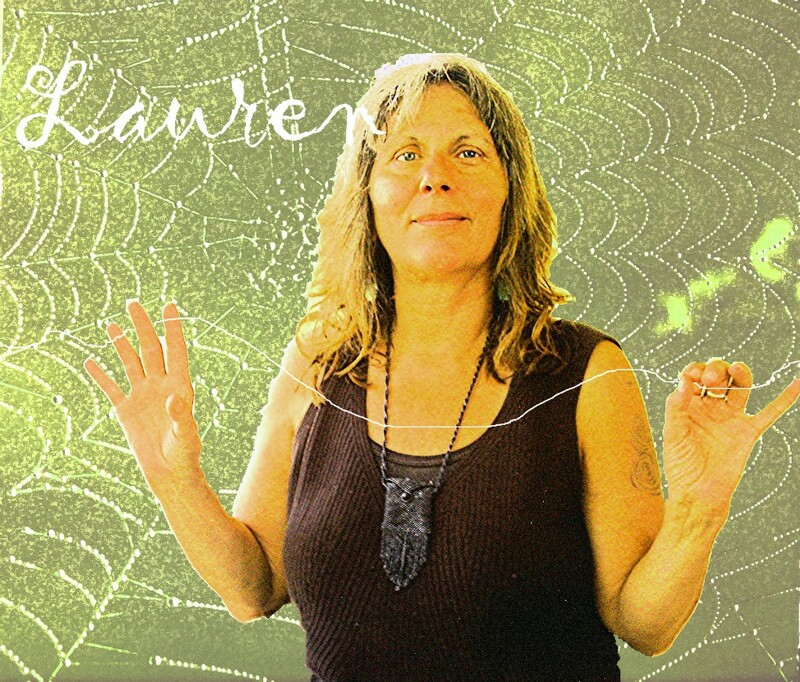 "What does an environmentally friendly biodynamic food system actually look like? Here's a blueprint for a post-industrial future. The outcome of the battle for agricultural control in India may just dictate the future of the earth. Our existence on this planet is precarious. Desertification, water scarcity, toxic cocktails of agricultural chemicals pervading our food chains, ocean ecosystem collapse, gmo, soil erosion and massive loss of soil fertility. Our ecosystems ore overwhelmed. Humanity's increasing demands are exceeding the Earth's carrying capacity. Modern agriculture causes topsoil to be eroded at 3 million tons per hour. (that’s 26 billion tons a year)- Human mass is replacing biomass and other species. The carrying capacity of the earth is almost spent. The mantra of free trade has failed the world’s poor. There is a better way. 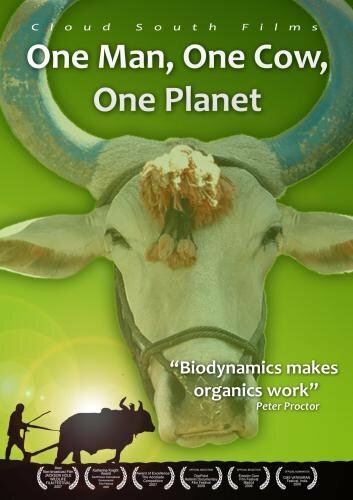 Biodynamic agriculture may be the only answer we have left." 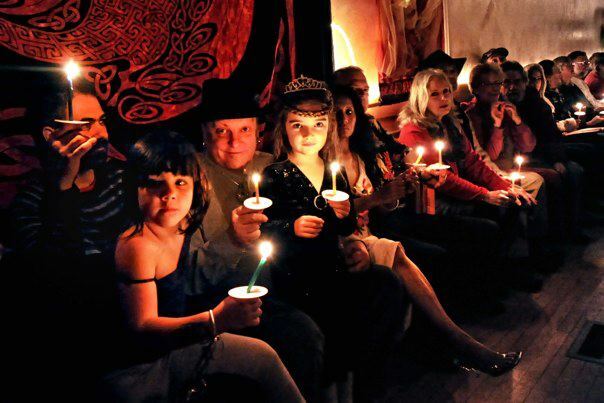 I wanted to share these wonderful photos from the Solstice ritual my colleagues Ann Waters (visit her blog Annie Green Jeans) and Mana Youngbear, creator of The Muse in Willits, both in Northern California, put on at their community center. 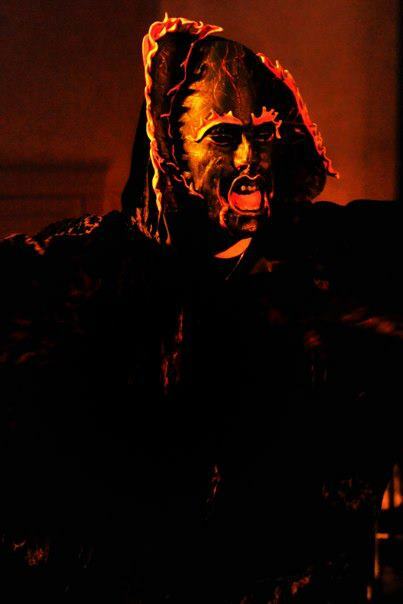 I feel very privileged that they use my masks, and they are evolving a full performance to be tentatively produced in March. Everyone loves, especially, the photo above of Dawn presiding over the cauldron of a new year and new world............it's the "year of the snake", and note the flame rising from the cauldron that looks very much like a snake. Snake is an ancient symbol of the Earth Mother, with origins that go back to prehistoric Egypt. We'll take that as a sign! In fact, as I was preparing this post, there was a lovely synchronicity. I was answering an email from Mana, informing her that a new set of masks had been shipped, and concluded the note by asking what she thought was "next" to make. 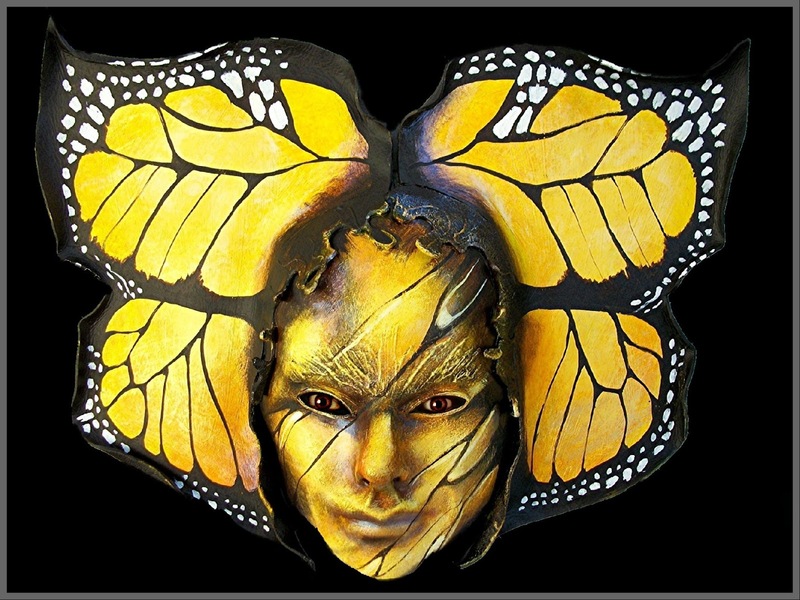 After sending out the email, I noticed a new email had just popped up, titled "Butterfly Woman". It was from a woman in Ireland who works with children, using stories for therapy, and she was asking permission to use the image from my website. I would say, synchronistically speaking, that's a pretty "instant answer", so off to the studio to make another Butterfly Woman mask (the ones pictured were sold long ago), and they can put these ideas of transformation, chrysalis, and children, who are the future..........into their Cauldron of Evolution. 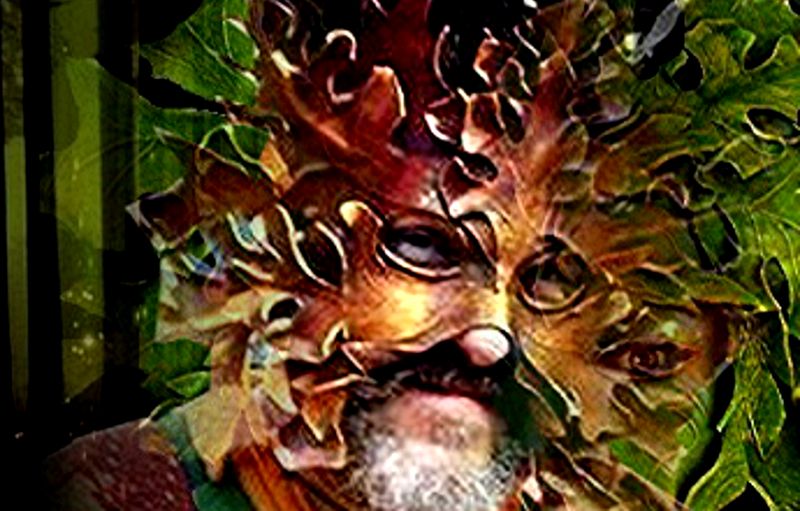 Meanwhile, gratitude to all those who wore these masks, and produced their beautiful Solstice. 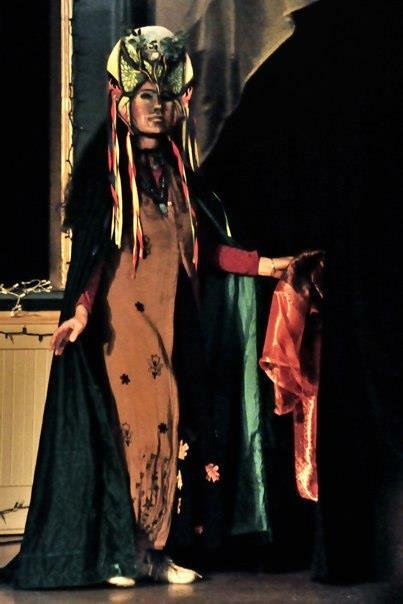 And gratitude to the photographer, Jerri Jo Idarius (all these photos are copyright J.J. Idarius). I wish I had been there, but the photos give me inspiration and impetus. I watch a lot of films while I work, which I guess my posts demonstrate, but I consider it a great privilege of our time that so many important films are available, many virtually for free. Thanks to the rapid evolution of video technology, people can make professional and effective documentaries, whereas 20 or 30 years ago this was not possible. It's an incredible resource, and great generosity on the part of those who allow their work to be shared. We are fortunate indeed to live in a time so much profound information is available, literally at our fingertips. In 1975, I ran across a book by Dr. Paavo Airola, a famous naturopathic doctor, and after reading it spent most of my tax return on a Challenger juicer (which I still have). Airola and Gerson were contemporaries. Dr. Gerson emigrated to the U.S. in the late 30's, fleeing the rise of Nazism in Germany. He developed a treatment, over many years, for cancer and other degenerative diseases, using nutritional therapy, supplements, and detoxification. He had many amazing successes with his protocol, including Albert Schwitzer (who praised him highly), and his own daughter, who recovered from tuberculosis and runs the Gerson Institute to this day at the age of 84. What is equally amazing is that in this country he is routinely discredited, dismissed as a quack, and Gerson Therapy is not even allowed to be practiced as medicine in the U.S.A. (The Gerson Clinic is in Mexico, not far from San Diego). Wikipedia's page for Dr. Gerson is dismissive and discredits his work.........which makes the movie below all the more important to watch. As the film points out, the "establishment" can be very narrow minded, and cancer is very big business. I've lost friends to cancer, including my dear friend Felicia to breast cancer in 2010. Dr. Gerson died in 1959 under mysterious circumstances - he had finished his manuscript for the book above, and became ill. While recovering, the manuscript disappeared. When he was well again he wrote the entire book once more from only his notes. Shortly after it was published he became ill again, and having himself tested, learned that he had been poisoned with arsenic. If he had not recovered from his first illness, there would have been no book about his work. What I understand from both Airola and Gerson is that in treating disease the best way to recruit the healing abilities of our bodies is to 1) provide maximum, easily absorbed nutrition, in particular, from green vegetables, and living foods that have lots of enzymes which are absolutely vital in healing and detoxification. 2) Juicing allows us to absorb very high quality organic nutrition, but doesn't demand the amount of energy that eating solid foods does, allowing the body to devote more of its resources to healing and detoxing, which it does when fasting. And 3) to facilitate detoxification in all ways. Gerson's diet for people who are critically ill is very limited: no meat, no dairy, no corn, no legumes, no grains, no soy, no nuts or seeds, no oils (including avocado), no alchohol, and certain foods, such as berries, bananas, and yams, are also excluded. The diet is readily available in books published by the Gerson Insitutute or just online, including explanations of why certain foods are, for the course of healing therapy, to be avoided. They make no secret of the protocol. ( http://www.fatsickandnearlydead.com/) in which he, and then a friend he made along the way to filming his project, fasted for 60 days on juice. Joe has a great website, with lots of testimonials from people who've taken inspiration from his film and gone on to "reboot their lives". In Dying To Have Known, filmmaker Steve Kroschel went on a 52-day journey to find evidence to the effectiveness of the Gerson Therapy – a long-suppressed natural cancer cure. "His travels take him across both the Atlantic and the Pacific Oceans, from upstate New York to San Diego to Alaska, from Japan and Holland to Spain and Mexico. In the end, he presents the testimonies of patients, scientists, surgeons and nutritionists who testify to the therapy’s efficacy in curing cancer and other degenerative diseases, and presents the hard scientific proof to back up their claims. You will hear from a Japanese medical school professor who cured himself of liver cancer over 15 years ago, a lymphoma patient who was diagnosed as terminal over 50 years ago as well as noted critics of this world-renowned healing method who dismiss it out of hand as pure quackery. So the question that remains is, Why is this powerful curative therapy still suppressed, more than 75 years after it was clearly proven to cure degenerative disease? The viewers are left to decide for themselves." His comment has sparked controversy, including one very dense journalist who said he had visions of blond valkyries riding forth to battle armageddon. Some people seriously can't think outside the box. To me, the Dalai Lama is, and always has been, a very practical man, and what he comments on is the arising of women and woman's priorities in our war torn, greed driven world. Western women predominantly have access to education, empowerment, and resources that their sisters in poor nations are struggling to gain (and they will). I've been feeling lately that this year, 2013, is going to be very much about the arising of women and the rising of the Goddess. My sense about this is almost too much for me to somehow squeeze into an article or blog entry...........it's from scanning many bits of information and news that have been coming my way lately. And, from dreams. Here's a movie coming out that seems very hopeful to me, and includes interviews with some of my favorite cultural transformers, women who have profoundly impacted our world: Riane Eisler, Jean Shinoda Bolen, Sandra Ingerman, Gloria Steinem, and others. 13 is the magical number of the Goddess, and has been for a very long time, because there are 13 lunations in a month (month -moon), and 13 menstrual cycles. The origin of the "unlucky Friday the 13th" myth may go back to patriarchal re-mything of symbols once sacred to the Divine Feminine, as Friday derives from the name of an ancient Nordic goddess, Freya (Friday - Freya's Day). So, for people inclined like myself, Friday the 13th is a lucky day, because it's a sacred day of the Goddess. So, may 2013 see the profound arising of the feminine, bringing healing, justice, peace, and Restoring the Balance. “At a time when it is clear that life and business as usual is leading us towards collective calamity, we search for signs and wisdom that can help us imagine a new world and tell ourselves a new story. If women are to help lead the world towards a more just, peaceful, and abundant future, what is it that lives in women that holds these keys? What might live in us that we haven't considered as sources of strength and ingenuity that could support our coming together in unity to co-create and birth a new earth? Women always have been at one with birth and renewal, and Mother Nature shows us that the life cycles of the seed, from blossom to death to re-birth, are part of our universal reality."